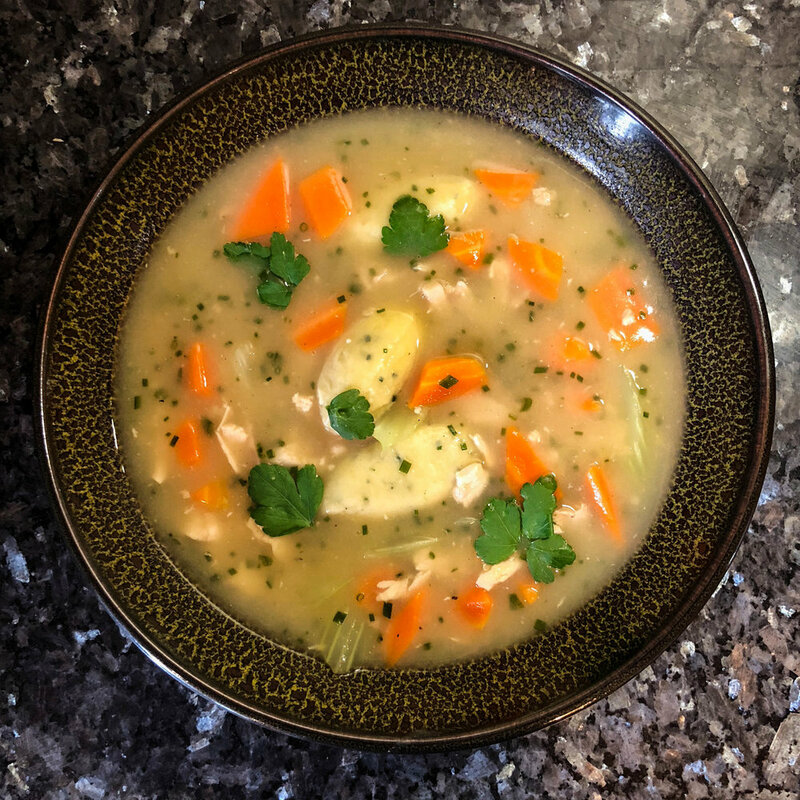 This is a very tasty soup but it does take a fair amount of effort ... worth it if you have the time ... there will be a different (that I prefer) chicken soup recipe coming from my old pal Ottolenghi! Add the carrots, celery, onions, and leeks, season with salt. Reduce the heat to low and cook very slowly, stirring occasionally, 30 to 35 minutes, until the vegetables are tender. Remove and discard the parchment lid. Fill a wide deep pot with salted water and bring to a simmer. Set up a stand mixer ﬁtted with the paddle attachment. Combine the water, butter, and 1 teaspoon of the salt in a medium saucepan and bring to a simmer over medium-high heat. Reduce the heat to medium, add the ﬂour all at once, and stir quickly with a wooden spoon until the dough pulls away from the sides of the pan and the bottom of the pan is clean. The dough should be glossy and smooth, but still a little wet, enough moisture must evaporate from the dough to allow it to absorb more fat when the eggs are added. Continue to stir for 4 to 5 minutes, adjusting the heat as necessary to prevent the dough from coloring; a thin coating of dough will form on the bottom and sides of the pan. When enough moisture has evaporated, steam will rise from the dough and the nutty aroma of cooked ﬂour will be noticeable. Immediately transfer the dough to the mixer bowl. Add the mustard and the remaining teaspoon of salt and mix for a few seconds to incorporate the ingredients and release some of the heat. 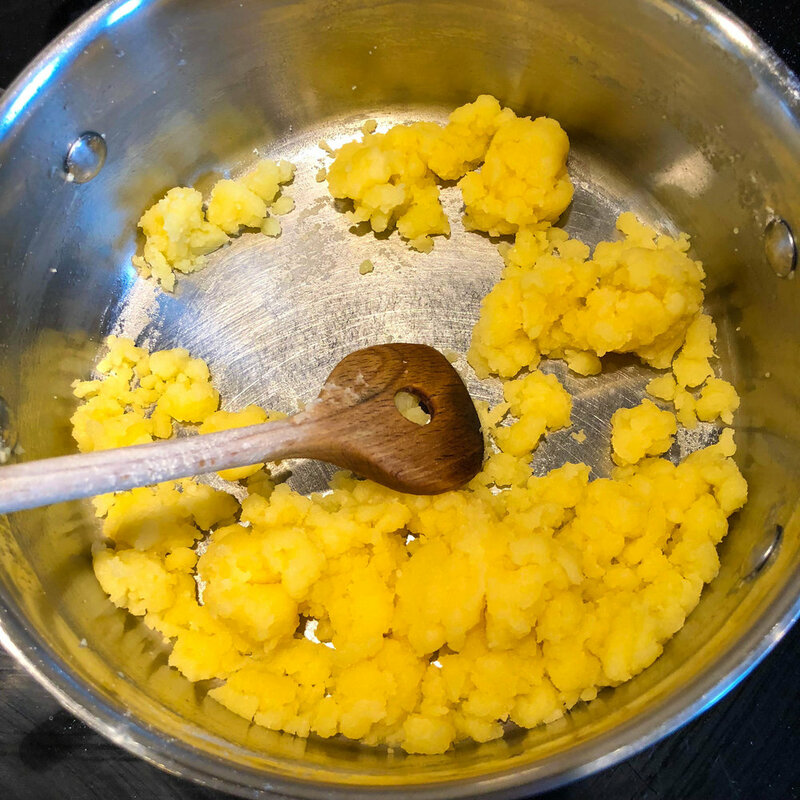 With the mixer on the lowest speed, add the eggs one at a time, beating until the ﬁrst egg is completely incorporated before adding the second and incorporating it. Then add the chives and incorporate. Remove the bowl from the mixer. Line a baking sheet with parchment paper. Shape the dumplings using two soupspoons to make a quenelle shape (see below), dropping them into the simmering water. Cook the dumplings in batches of about 6 to avoid crowding the pot and allow them to cook evenly. Once the dumplings have cooled, trim any uneven bits off. Add the chicken stock to the vegetables and bring to a simmer. Simmer for 30 minutes. 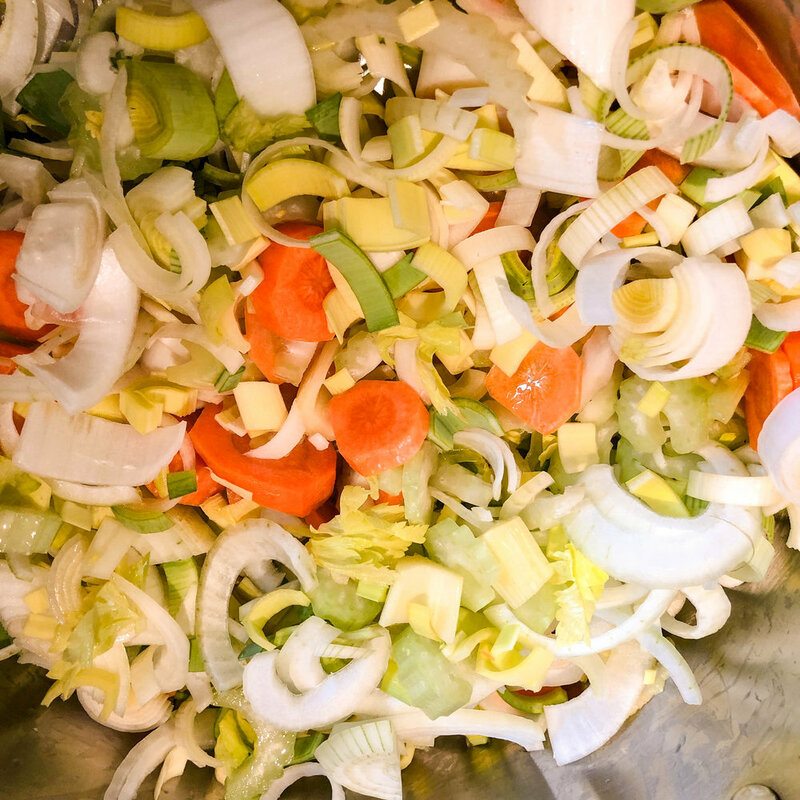 Strain the soup base into another pot and discard the vegetables. Peel the celery stalks with a peeler (make sure to do this as it gives it a nice finish). Cook the celery in a large pot of boiling salted water until just tender. Cut the carrots lengthwise into quarters and then crosswise into bite-sized pieces. As each carrot widens, adjust the size of the cut to keep the pieces bite sized. You need about 1 1/2 cups carrots for this recipe. 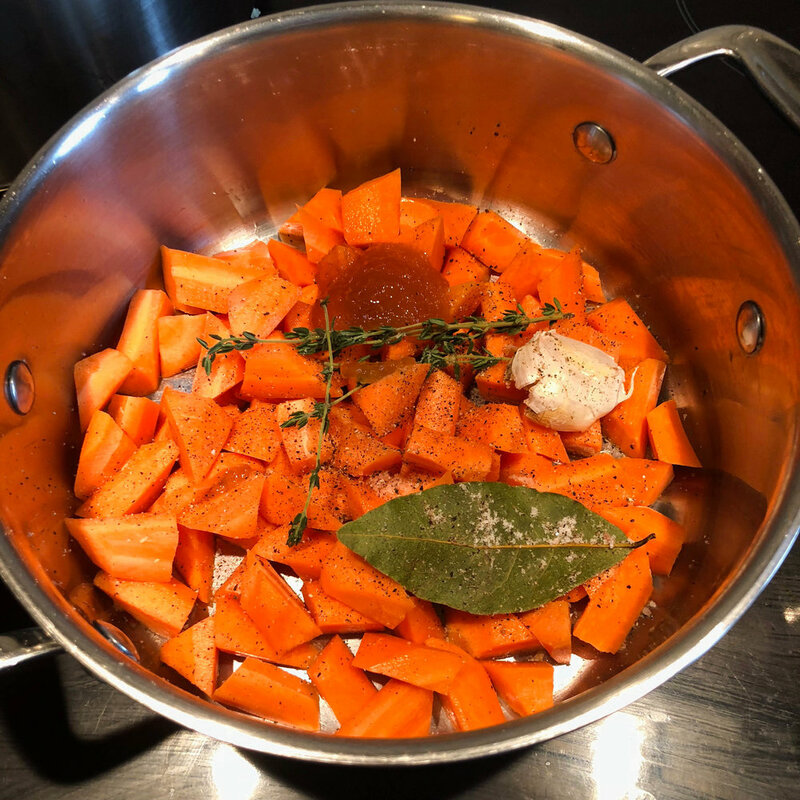 Put the carrots in a saucepan, add the honey, bay leaf, thyme, garlic, and a pinch of salt and pepper, and cover with cold water. Bring to a simmer and cook for 4 to 5 minutes, or until the carrots are tender but slightly resistant to the tooth. Drain and transfer to paper towels. Add the dumplings, chicken, carrots, celery, and chives to the soup and heat through. Season with the vinegar and salt and pepper to taste. Transfer to a large serving bowl and sprinkle with parsley leaves. He taught me well ... eventually !!!! Take one spoon and scoop up a portion of dough that is a little smaller than the spoon. Hold the second spoon in your other hand, place the side of the spoon against the far side of the dough, and scoop it onto the second spoon, forming one long smooth side. Helpful tip ... have a bowl of warm water beside you ... where you can dip the spoons frequently ... this will make it easier to shape the quenelles. This is the most traditional of French methods for thickening soups or sauces ... made by cooking equal parts of butter and flour. 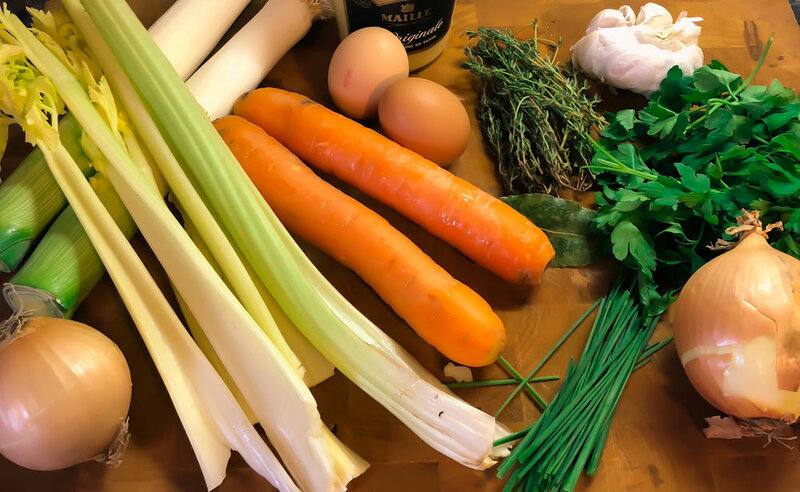 HINT for a smooth sauce, add room-temperature or cold roux to a simmering liquid, or add cold liquid to a hot roux, to prevent the roux from firming up. Put the butter in a small skillet or saucepan and set it over medium heat. Continue whisking constantly and adjust the heat as necessary so the roux bubbles but does not brown, 3 to 4 minutes. Transfer to a bowl or other container to cool. A little bit of Ballymaloe!